The overall objective of this project is to compile a document which provides clear and concise explanation of the City’s existing storm water management program, presents a detailed investigation into key components of stormwater as it is related to the City, establishes stormwater management goals for the future, presents tools to meet or exceed established goals and provides a foundation for future policy decisions. (1) All land-disturbing activities and all development or redevelopment activities that disturb an area greater than or equal to one acre. (2) Sites that are smaller than one acre may also be covered by these regulations if they are a part of a larger common plan of development or sale. (3) Any nonresidential development for which the area paved and under roof is equal to or greater than 10,000 square feet. The requirements for the Stormwater Management Plan and associated design criteria are outlined in Chapter 50 Article III of the Paducah Code of Ordinances. Storm water management and how the public can help maintain flow into the system are highlighted in this episode of Paducah View (6:09 minutes). All commercial developments and additions in the City require a site plan be submitted to the Department of Planning (270-444-8690) for review before any building permits can be issued. The process starts with a preliminary meeting with staff to discuss the proposed improvements and elements required to be on the plan. Site plans should be drawn according to the Site Plan Checklist unless otherwise directed by staff. Once an adequate site plan is submitted, Planning staff review it for compliance with applicable planning & zoning regulations. If acceptable, Planning staff will sign off on the plan and forward it to the Engineering-Public Works Department (270-444-8511) for review. Once approved by Engineering-Public Works, the plan is then forwarded to the Fire Prevention Division (270-444-8527) in order that building permits can be issued. For more information about site planning including a checklist of requirements and standard notes for erosion prevention and sediment control and floodplains, visit Site Plans. Storm Water Phase II is an initiative of the United States Environmental Protection Agency that helps control pollutants entering waters of the Commonwealth. The Storm Water Phase II program consists of six minimum controls. Those controls are Public Education, Public Involvement, Illicit Discharge Detection and Elimination, Construction Site Stormwater Runoff Control, Post Control Stormwater Management in New Development and Redevelopment, and Pollution Prevention/Good Housekeeping for Municipal Operations. As part of the Storm Water Phase II Program, the City of Paducah is responsible for regulating the MS4 System located within the corporate limits of the City with oversight from the Kentucky Division of Water. A Municipal Separate Storm Sewer System (MS4) means a conveyance, or system of conveyances (including roads with drainage systems, municipal streets, catch basins, curbs, gutters, ditches, man-made channels, and storm drains designed or used for collecting or conveying stormwater that is owned or operated by the city and discharges to waters of the Commonwealth. Sanitary and combined sewers are not included in the definition of the municipal separate storm sewer system. Excess sediment can fill rivers, lakes, and destroy aquatic habitats. Construction and development are positive for the community, but proper management of pollutants commonly discharged from construction sites is important to keep pollutants from harming local lakes and streams. In the City of Paducah, the Engineering-Public Works Department is responsible for creating ordinances and procedures that inspect sites and have them comply with regulations regarding site runoff. The three Ordinances below list the terms and regulations for erosion prevention and sediment control. What Is Illicit Discharge? Illicit discharge is any direct or indirect non-stormwater substance or hazardous material disposed, deposited, spilled, poured, injected, seeped, dumped, leaked, or placed by any means, intentionally or unintentionally, into the MS4 or any area that has been determined to drain directly or indirectly into the MS4. Federal regulations define an illicit discharge as “...any discharge to a MS4 that is not composed entirely of stormwater...” with some exceptions. These exceptions include discharges from NPDES-permitted industrial sources and discharges from fire-fighting activities. Illicit discharges are considered illicit because MS4s are not designed to accept, process, or discharge such non-stormwater wastes. Why Are Illicit Discharge Detection and Elimination Efforts Necessary? Discharges from MS4s often include wastes and wastewater from non-stormwater sources. A study conducted in 1987 in Sacramento, California, found that almost one-half of the water discharged from a local MS4 was not directly attributable to precipitation runoff. A significant portion of these dry weather flows was from illicit and/or inappropriate discharges and connections to the MS4. What Paducah is Doing. By Paducah Code of Ordinances Chapter 42 - 52, illicit discharge is illegal, punishable by fines up to $500. The City has developed a Standing Operating Procedure for Illicit Discharge Detection and Elimination (IDDE) to find, stop and eliminate all illicit discharges encountered. To report a spill or an illicit discharge, contact the Engineering and Public Works Department at 270-444-8511. (1) All land-disturbing activities including development and redevelopment activities that disturb an area greater than or equal to one acre. Sites that are smaller than one acre are also covered by this article if they are part of a larger common plan of development or sale as defined in this article. (2) Land-disturbing activities of less than one acre that have the potential to negatively impact local water quality, sensitive areas, or result in a nuisance to the public. This determination will be made at the sole discretion of the City Engineer or his designee. The requirements for the EPSC plan and associated permits are outlined in Chapter 50 Article IV of the Paducah Code of Ordinances. Before construction is started within the city limits of Paducah, the City of Paducah Engineering Department requires construction sites that disturb one (1) acre or more or fall under the additional requirements outlined in Chapter 50 Article IV of the Paducah Code of Ordinances to file for a Grading/Land Disturbance/Erosion Prevention and Sediment Control Permit. The Kentucky Division of Water (KDOW) also requires construction sites that disturb one (1) acre or more of land to file for a Kentucky Pollution Discharge Elimination System (KPDES) Notice of Intent (NOI) for Stormwater Discharges Associated with Industrial Activity Under the KPDES General Permit. Automatic coverage of construction sites under this permit will no longer be applicable. The Kentucky Division of Water state that the permittee shall submit web-based NOI forms at a minimum seven (7) days prior to land disturbance activities or paper NOI forms thirty (30) days prior to land disturbance activities. Proof of site coverage shall be included with the City's permit. The new KYR100000 Permit replaced the General KYR10 Permit on August 1, 2009, and it shall be required for applicable construction sites. For existing construction sites covered under the KYR10 General Permit, coverage will expire on July 31, 2010. If a site has not achieved final stabilization by this date, a new NOI shall be submitted to the Kentucky Division of Water and the Storm Water Pollution Prevention Plan shall be modified to fit the conditions of the KYR100000 Permit. The general permit conditions for sites covered under the previous KYR10 Permit are outlined in the link below. Periodic site inspections are required to be performed by the permittee or the designated site contractor at least once every seven (7) days and within 24 hours of the end of a storm that is 0.5 inches or greater. For work in the City of Paducah, a Construction Site Inspection Form has been developed by the Paducah Engineering Department for the contractor's use. When construction activity is completed, some erosion control devices are no longer needed, and vegetative cover is established, the permittee shall file for a Notice of Termination (NOT) with the KDOW and a NOT with the City of Paducah. A final inspection by the City of Paducah Engineering Department may be required. Why care about Stormwater Quality? Stormwater contains pollutants that come from areas developed by people, and those pollutants affect our community’s water quality. The amount or volume of stormwater that runs off of urban and suburban areas is often greater than the amount of stormwater that runs off forests and farms. Buildings, rooftops, roads, and driveways are made of solid, impervious surfaces, so stormwater runs off these areas. In forests and on farms, trees, plants, crops and natural soils allow stormwater to soak into the ground, so less stormwater runs off these areas. As the amount of stormwater runoff increases, so does the amount of pollution it picks up. What Is Paducah Doing To Improve Stormwater Quality? The City of Paducah has developed a Stormwater Quality Management Plan (SWQMP)—a roadmap for stormwater management activities to comply with the Stormwater Quality Program permit. The SWQMP is reviewed every year and updated annually if needed. The Stormwater Quality Program permit and plan are based on six program areas designed to improve stormwater quality or which are monitored, assessed and reported on annually. Rain barrels collect and store rainwater from your roof that would otherwise be lost to runoff and diverted to storm drains and streams. The Jackson Purchase Foundation is a local 501(c)(3) organization that sells plastic rain barrels to the public. The cost is $40 per barrel with the proceeds benefiting the artistic rain barrel program by helping to pay for the barrels and supplies for the local schools that participate. If you have a question about the barrel or would like to order a rain barrel, contact the Jackson Purchase Foundation at 270-908-4545. 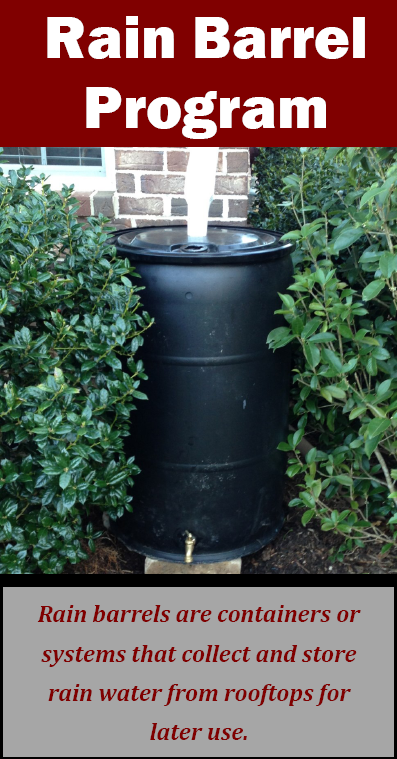 Helps Reduce Runoff Pollution: Rainwater stored in rain barrels helps reduce the amount of runoff and the amount of pollution that is picked up off the land surface and carried to storm drains, streams, and rivers. Conserves Water: Lawn and garden watering makes up nearly 40% of total household water use during the summer. Rainwater used from rain barrels helps reduce the amount of water used from local sources. Better for Plants and Gardens: Rainwater stored in rain barrels is naturally soft water and doesn't contain minerals, chlorine, fluoride, and other chemicals. Plants respond well to this. After all, its what plants in the wild thrive on! Saves You Money: A rain barrel will save most homeowners about 1300 gallons of water during the peak summer months. Saving water not only helps protect the environment, it saves you money and energy. Did you know...that one inch of rain falling on 1000 square feet of roof can yield 600 gallons of water? Don't let this free water run away!